Salvatore Ferragamo will launch Incanto Bloom next March. 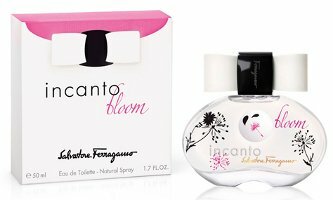 The new fragrance targets a more sophisticated audience than the prior flankers in the Incanto series (Incanto Dream, Incanto Charms, Incanto Shine, Incanto Heaven, Incanto Bliss). The fruity floral fragrance was developed by perfumer Sophie Labbé; notes include grapefruit flowers, freesia, tea roses, champaca, musk and cashmere wood. It’s like if Jerry Bruckheimer and Michael Bay made perfumes. And the bottle is HIDEOUS! Perhaps it’s what Megan Fox’s character wore in that latest wreck of a Transformers movie? It’s a formula that appears to be working really well for Ferragamo…these seem very popular! So far have not cared for any of them though. But I’d like the bottle if it didn’t have that cap. I think my sister has at least 2-3 of these…they smell pretty good on her, actually. On me, they’re sugar water. Then the flanker would be called “Incanto BOOM!! !” and the perfume ad would feature Megan Fox on a Harley lit by an impossible orange sunset. I mean, as an amateur photographer I figured long ago that people photograph so much better illuminated by the sunset (or dawn) but if you got to see “Transformers II, Revenge of the Fallen” you know what I am talking about, they just overuse that recourse to the death. Incanto Boom — LOL! Excellent. Targeting a more sophisticated audience with THIS?? Umm… Ok. The box reminds me of Exclamation, so maybe I’m holding that against it more than I should. I KNEW that bottle was tickling a memory somewhere in my brain. well, as sophisticated as that bottle will allow…. i guess late teens? grapefruit flowers? would that make it a floral then as opposed to a fruity-floral? no diff, i guess – i like the bottle! My sister had a shampoo that smelled EXACTLY like one of these. Charms, I think. It was nice as a shampoo but as a perfume…. I kinda like the bottle but the top looks cheap even in the press picture! I like the bottle itself too…that cap has to go. Although Grapefruit Flowers Or as i like to call them… Fleurs De Pamplemousse… are actually INTENSELY Floral with only a slight biting citrus undercurrent to them. I ADORE the smell of Fleur De Pamplemousse. would love to make a fragrance one day called just that! I might like this as well, especially with the Champaca and Delicious Freesia! Agree about that Bottle. Eyesore! meant to say, ACTUALLY in the above not ALTHOUGH! LOL DUH!!!@TheNoseKnows! LOL! I have not smelled it yet, but so far have not been impressed with any of the Incanto series. I think they do very well though! Yeah I havent cared for any of them either. I was at nordstrom and the Ferragamo vendor was there trying to get be to buy the new Black and she gave me samples of Bloom. I thought the Black was nice but I went w/ the Terre D’Hermes perfume for my dad. That ones BRILLIANT!!! I actually don’t hate it. Freesia and champaca are two of my favorite flowers. I agree the bottle is hideous. Thumbs up for the bruckheimer joke. LOL.